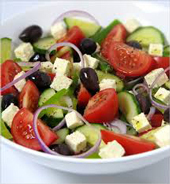 We Are committed to supplying the freshest ingredients available for our Greek and Italian crusine. This is done by visits to the farmers market every morning at 4 o'clock to handpick the ingredients that are used in the restaurant. Greek and Italian cooking is a family tradition that has been handed down for generations. You can be guaranteed of authentic Greek and Italian food at a fair and reasonable price. We also supply party trays for any type of function.